23/10/2012: EE launch their 4G plans, Nokia announces a $199 Windows Phone and more! 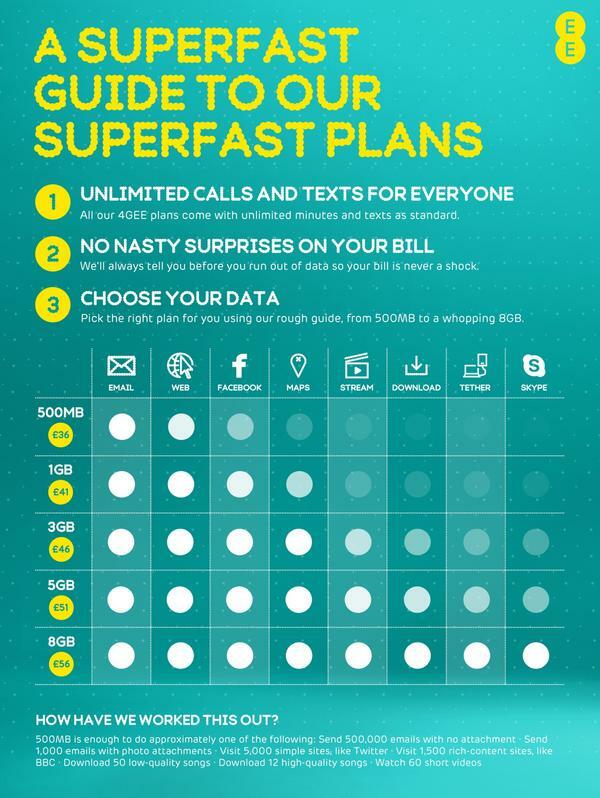 EE launches their 4G plans: No Unlimited option! EE announced their new plans at midnight last night and we here at TTF are very disappointed to say the least. Most people were holding out for an unlimited tariff which is definitely not what we got here. Although, EE gave us plenty to choose from assuming you're willing to pay through the roof for your data. Firstly, all the plans you see below have unlimited messages and voice calls included. Internet on the other hand is where things start getting expensive. The packages, which are in the infograph below stop up in £5 increments. The minimum plan will give you 500MB of data, then depending on how desperately you want more internet it'll cost you £5 extra every time you bump up your allowance, which could be to 1, 3, 5 or 8GB's of data depending on your preference and of course your wallet! As a final word of warning, if you do want 4G LTE right now it might not necessarily be all it's cracked up to be. EE only promises 4-5 times faster than their current 3G network which they rate at 1.5-2Mbps. Which would make their promised LTE speeds somewhere in the region of 6-10Mbps per second. Then there's the other company's which will be offering plans in the new year, so perhaps it's worth holding it especially if you currently have the luxury of unlimited data anyway! Apple will be announcing their new device(s) this evening and we will cover it in a separate post! Amazon has today branded their Kindle Fire HD as the company's “#1 best-selling product across all of Amazon worldwide". Now that's quite a broad statement because it could be for any time scale. The company also announced the device was the world's most popular 7" device, we're not sure where they got their figures from, but they must be shifting a fair few to beat out Google's Nexus 7! However we look at it though, it's still quite an achievement for the online giant! Dropbox have updated their iOS app so it now enables full-resolution image downloads and iPhone 5 support! Dell has announced a slew of Windows 8 devices and included pricing, the full list is here. Apple's "bounce scroll" patent has been invalidated preliminarily by the US Patent and Trade Office. This could potentially have serious repercussions in Apple's legal tangling's with Samsung. The decision by the USPTO to tentatively withdraw patent 7,469,381 is down to "lack of novelty" according to FOSSPatents! And finally, Nokia has launched a new low-end Windows Phone, running WP7.5, called the Lumia 510. The phone features a 4-inch WVGA 800×480 TFT display, a Snapdragon S1 processor and 256MB of RAM. There's 4GB of internal storage but no SD slot either, Nokia is hoping the 7GB of free SkyDrive cloud storage will go some way to over-coming that hurdle. There's also a decent 5MP camera with autofocus, and a 1300mAh battery! So distinctly average yes? We would agree until we hear that the phone is available for $199 off contract! That price alone makes it infinitely more attractive!